The meeting started with Constable Gordon Burgess talking about the essential duties of his job, Roland Hopwood talking about the importance of tenant screening and Board Members, landlords, and real estate salesman/broker John Ray and Linda Silveira talking about the local New Bedford and Fall River real estate market. Next meeting will be May 3rd and will feature the head of New Bedford recyclables Marissa Perez-Domitzer and wait for it, MAYOR JON MITCHELL. You won’t want to miss this! 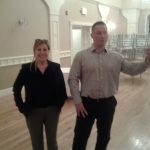 Linda Silveira and John Ray talking about the local New Bedford and Fall River real estate market, how to get the best deal and receive the best price. Roland Hopwood talking about the importance of tenant screening.